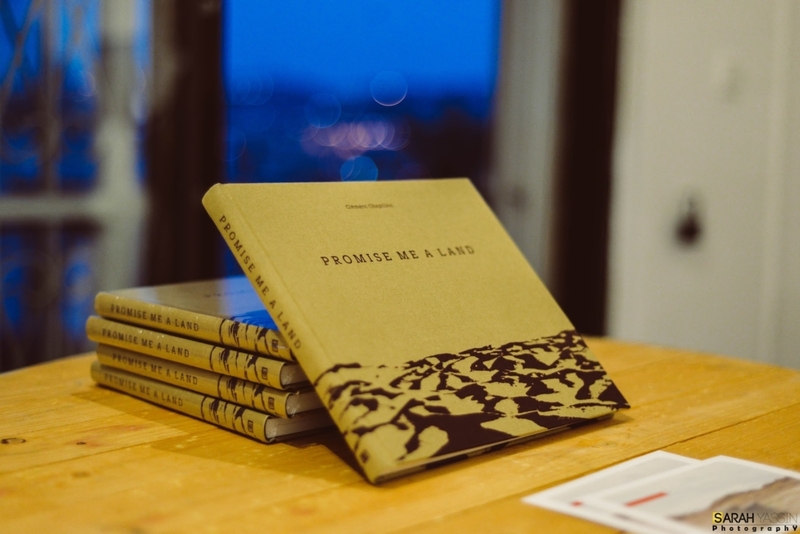 “Promise Me a Land” is a project by French Photographer Clement Chapillon which focuses on the bond between people and their land, with the aim to explore the imprint that this land has left on its inhabitants’ identity, in a manner far from traditional clichés. 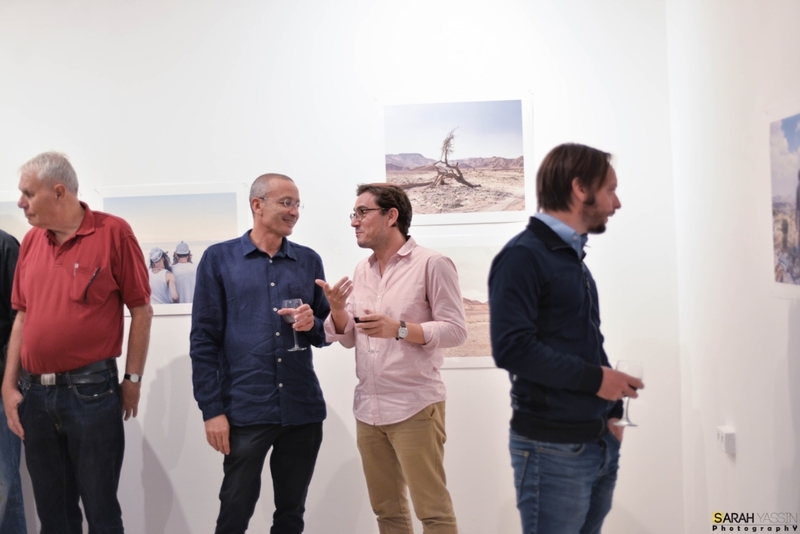 Petra Klose, our Social Art Project Coordinator, was invited to Gaza by UNESCO to meet potential partners. In the following text Petra tells about her experience. When I received the message “You will be leaving for Gaza at 8.30 tomorrow morning“ – I could actually not believe it. I had planned to go to Gaza several times before but every time the trip was cancelled due to security reasons. After the recent bombings and casualties, I couldn’t imagine that it would work out this time. 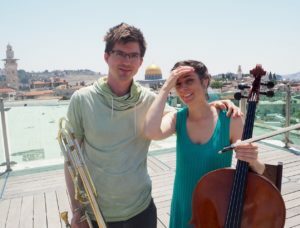 But thanks to our partner, the UNESCO, I was allowed to join a UN car to drive from Jerusalem to Gaza the next morning to do some research for upcoming concerts and music workshops. 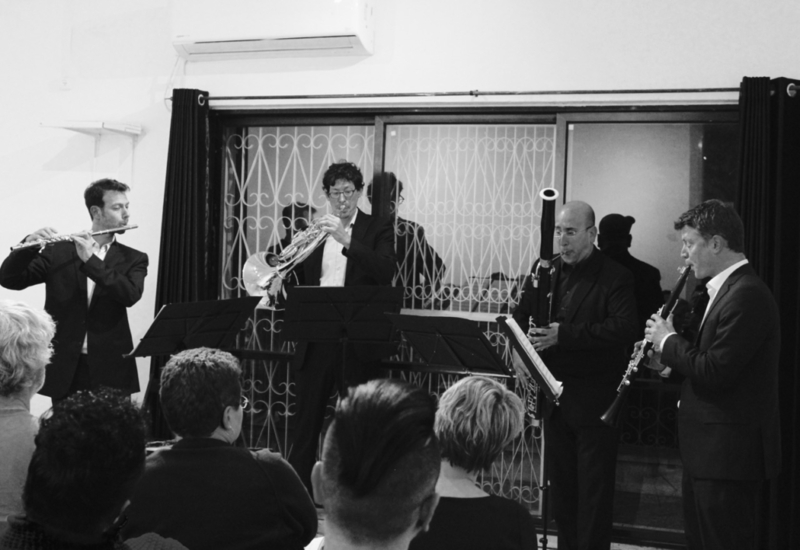 We had decided to develop a series of jazz performances with local and international musicians, trusting in the power of jazz music in promoting creativity and intercultural dialogue. Having dealt with all formalities at the Israeli border control, the UN car was allowed to drive through the Erez crossing. Yellow signs showed directions towards “Israel“ and to “Gaza“. What kind country is Gaza? I wondered. A large, immensely high gate opened ahead of us – and closed behind us. “So this is how it feels when ‘you’re in’, I thought, being aware that it is completely ridiculous to talk about hiding your feelings when you know that you will easily be able to leave in less than 24 hours. On the other side I was met by the UNESCO team who accompanied me to have my papers checked and approved twice more, firstly by officials of the Palestinian Authority and secondly, by representatives of the “de-facto government“ – in other words Hamas, in what looked like a makeshift office in a container on a construction site. Finally, we were able to drive into Gaza City. I was overwhelmed by the many bright lively colors. I don’t know why I had expected everything to be grey or covered in a thick layer of dust and rubble. In my mind Gaza had always been connected to images of military operations, protests of angry crowds, or most recently reports of the so called “Great March of Return“. 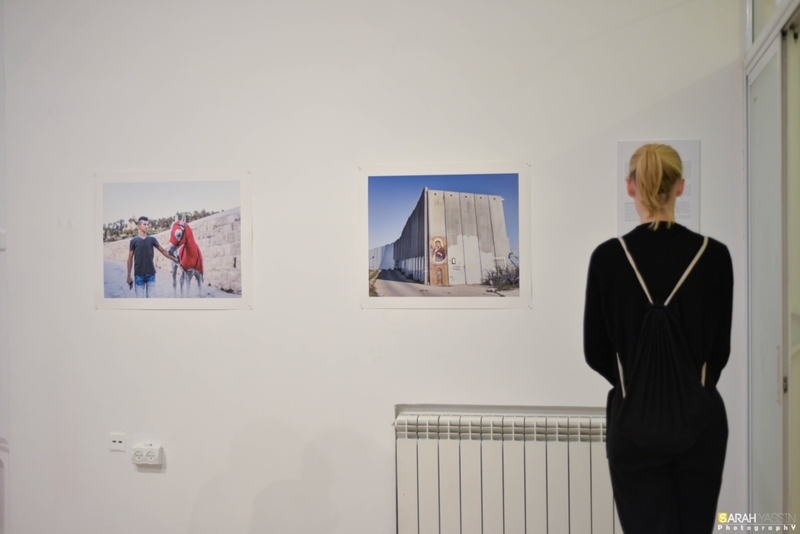 At the UNESCO office I had the chance to meet with Gaza artists for the first time. From an artistic point of view, the encounter was in no way different than any other production meeting for an upcoming music event; talking about the concept, rehearsal schedules, instrument and musical arrangements. 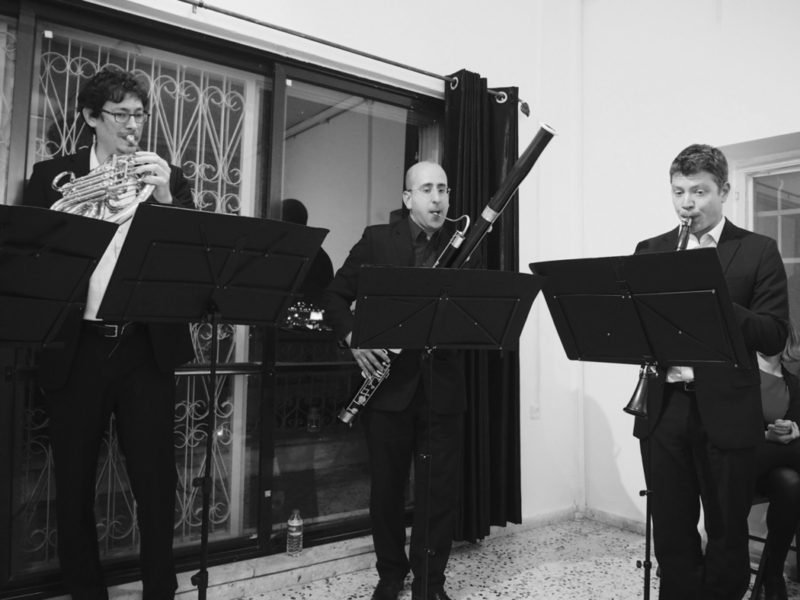 Nevertheless, certain things had to be taken into consideration, such as the application of permits for musicians from the Westbank, the coordination for artists from abroad or the procedure to obtain permission for a public event. After the meeting we looked at potential concert venues. Again, I was surprised to find beach clubs, discos and fully equipped theatres, as well as beautiful hotels with marble floors and fancy swimming pools. The last thing I had expected to find in Gaza were people having fun in a pool. However, on second glance I could see that there were only men and children in the pool. Women sat fully veiled at the pool edge. Contradictions and contrasts everywhere. On our journey we drove along kilometers of overpopulated shabby dwellings of refugee camps and passed by the ruins of the cultural center which had been bombed a week before my arrival. On the collapsed walls somebody had written in bold red letters the words: “Free Palestine“. In the end we found the perfect location for our jazz performance. A small archaeological museum and guest house with a breathtakingly beautiful sea view terrace. 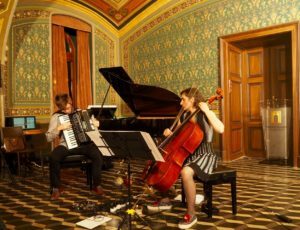 It looked like the ideal place to connect traditional heritage with a contemporary experimental music performance. In the museum I discovered in the midst of byzantine columns a big showcase, displays of coins from the Austrian Hungarian Empire which had been excavated in Gaza. At first I thought that my mind was playing tricks on me, but there was in fact the profile of the Empress Maria Theresia right next to other antique coins, mostly from the Roman Empire. As locked up as we think of Gaza today, we forget how this place had always been at the crossroads of different cultures and empires between Africa, Asia and Europe. Our next meeting took place at the Roots Hotel, one of the few places which offer the necessary security clearance for internationals. A small iron plaque beside the entrance caught my eye: “Build by Utopia Design“. The hotel was extremely comfortable with all technical amenities, only the noise of the generators reminded me of the long electricity cuts in Gaza. The terrace offered the most amazing panorama, to the right a beautiful beach, to the left the port of Gaza City with dozens of fisher boats lined up in the dazzling sun. I took a picture and sent it to Nadine, a Palestinian friend of mine living in Vienna, who is currently writing a book about her family’s history. She replied „This will be the hippest summer travel destination in 2025“. She wasn’t cynical about it. Nadine represents a mindset that believes in a world in which anything can happen. In theatre, we use the term „Coup de Theatre“ – an unforeseeable change, a solution which would have been unimaginable only a few pages before. Even the one who is regarded as the greatest writer of all time, William Shakespeare, used this technique. The best example is in “The Winter’s Tale“. It is admittedly not considered one of his strongest pieces, offering an outrageously unrealistic and depressing plot with an even more outrageously unrealistic happy ending. I want to spare my readers the attempt of even trying to explain its narrative of tragic events and reunions after long-term separation. The play takes us to the coasts and deserts of the kingdom „Bohemia by the sea“. Being of Czech descent, what always puzzled me was that the historic Kingdom of Bohemia, which roughly corresponds to the modern-day Czech Republic, had neither a coast nor a desert. But the Shakespearean „Bohemia by the sea“ doesn’t correspond to any real country, it’s a purely fictitious kingdom which became a dictum in the world of literature for the projection of a Utopian country. When I was picked up from the hotel to start my journey back to Jerusalem it felt like driving through a movie with dimmed sound. Maybe it was partly due to the fact that the sandy streets swallow the sound of the cars but it was also evident that there are not many shops or working places open where people would head to during the day. I sincerely hope that the musicians with whom we are planning our upcoming events will create a soundtrack that matches the incredible range of colors of this place,as an inspiring overture to new rich soundscapes. What changed as a result of this visit? When I think about Gaza now, I don’t immediately think of groups of angry crowds, I see individual human faces. And it’s not only walls and fences that come to my mind, it’s wide promenades and beautiful sandy beaches. In a way Gaza became my personal “Bohemia by the Sea“, a high-contrast country, so close and at the same time, so far. All I can hope for as somebody working in the arts, is for some courageous writers who are ready and willing to come up with an inventive storyboard. Of course, any plot for this might seem even more unrealistic than anything Shakespeare has ever written, but if not artists, who would be allowed to dream and create such a utopia to make its audience believe in a happy ending in The Winter’s Tale. 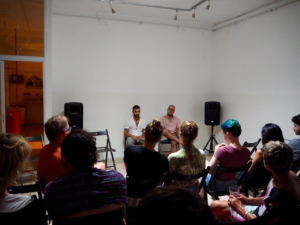 On July 17th we hosted a screening of the docu-series ‘Spectrums’ at the Willy Brandt Center. 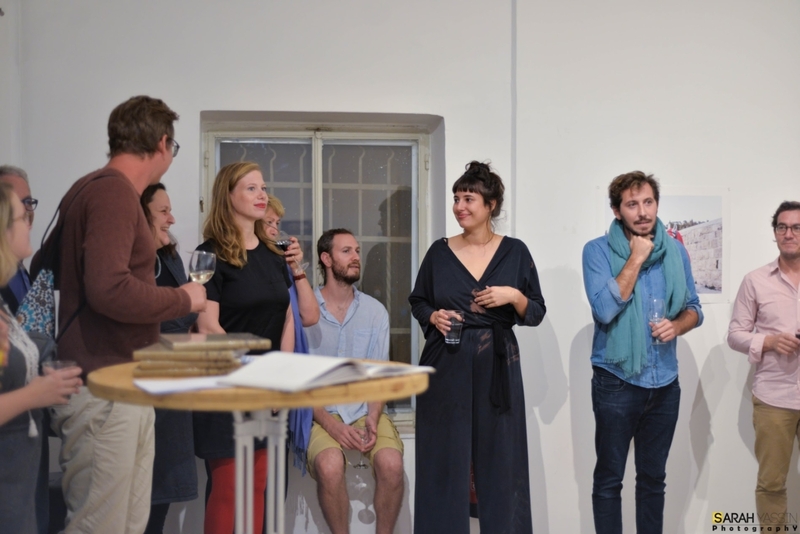 Afterwards we held a panel with the artists Afek Testa Launer and Zohar Melinek Ezra. 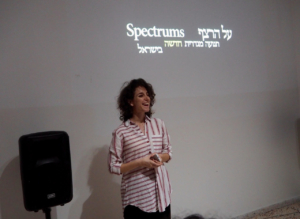 ‘Spectrums’ is a new Israeli docu-series that follows the social and spiritual worlds of 10 members of the transgender community in Israel. The series sensitively examines a broad and contemporary picture of Israeli society in all its shades through the stories of the characters. We watched two episodes. The ﬁrst one introduced us to the colourful character of Lioz, a young transgender woman, trying to cope with the binary deﬁnitions of what it means to be a man or a woman. Lioz shows her audience that there is indeed more than one way for a person to deﬁne themselves. The second episode tells the story of Toar, a transgender man who struggles with alienation from his family after his decision to come out as a transgender man. He shares extracts from conversations with his father with the audience and rediscovers moments of anguish. 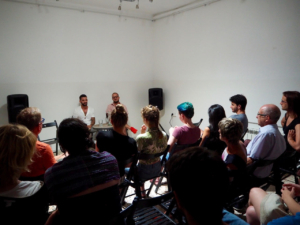 After the screening, the artists began to talk about their methods: how they met and what it was like producing the series. They revealed how the exposure wasn’t always easy for some of the participants after the series went online and why they decided to release the episodes for anyone to see without restricting it. 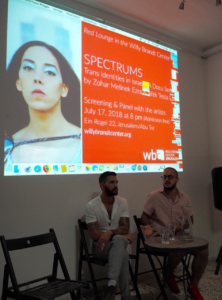 The audience also participated by asking them questions, for example how it is living as a transgender man/woman in Israel in comparison to other countries, what is coming up next, and whether the artists plan to do further projects exploring topics surrounding the meaning of being transgender. 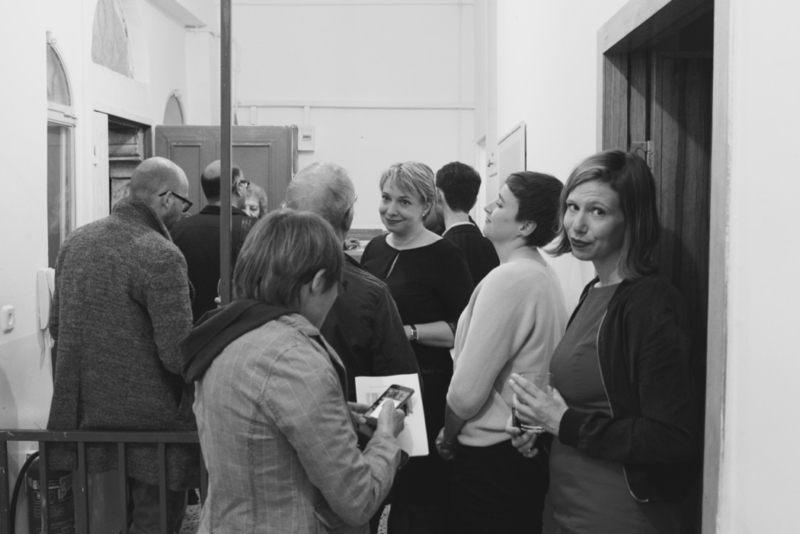 This was a valuable evening for both the audience and the artists involved. Bakr Khleifi is a young Palestinian musician from Ramallah who has already performed in prestigious venues around the world after becoming member of Barenboim’s West Eastern Divan Orchestra at the early age of twelve. For the Willy Brandt Center he prepared a rich and colourful journey showcasing male and female composers from Egypt, Iraq, Israel, Morocco, Palestine and Turkey. Bakr was born in Jerusalem and studied in Ramallah, Tel Aviv and Gothenburg receiving further artistic impulses in New York and Europe. The versatile artist plays the oud and the double bass and virtuously shifts between the classical, contemporary and traditional music world. Bakr’s inspiring performance incorporated a variety of musical styles and rhythms and took us on a journey across different centuries and regions. 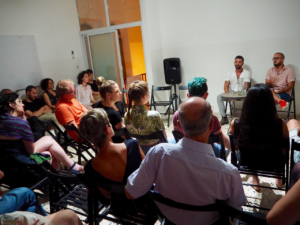 The audience curiously followed his explanations about the characteristics and history of the respective pieces. 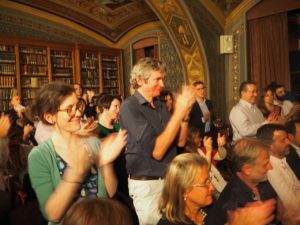 The final highlight was the world premiere of his first own composition. The evening concluded on the terrace of the Willy Brandt Center where the audience gathered to meet the artist and enjoy some Ramadan delights together. We are looking forward to Bakr Khleifi’s participation in future projects of the Willy Brandt Center. 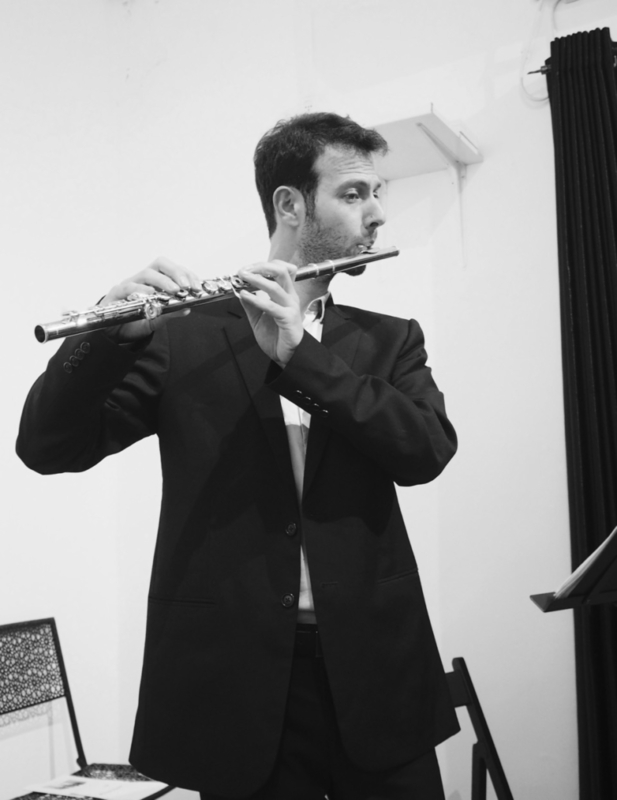 He will perform at the upcoming Jazz Journeys in cooperation with the UNESCO and our Orfeo music theatre project. The Willy Brandt Center partnered with the UNESCO International Jazz Day for the first time. The Jazz Day is a yearly event taking place around the globe on April 30th to celebrate the international art form of jazz and its power to promote dialogue among cultures. 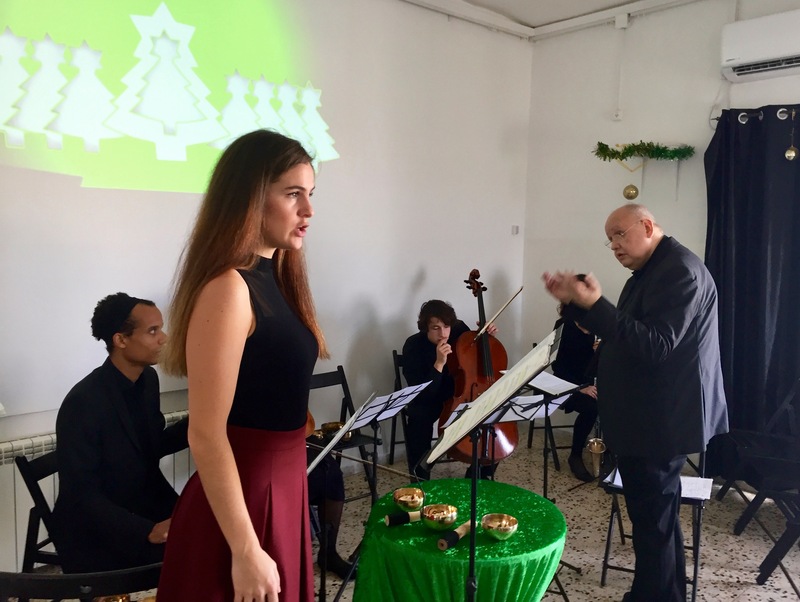 The Jazz Day performances featured the Austrian ensemble Sinfonia de Carnaval, and took place in front of overcrowded halls on the campus of Bethlehem University and at the Austrian Hospice in the very heart of Jerusalem’s Old City. 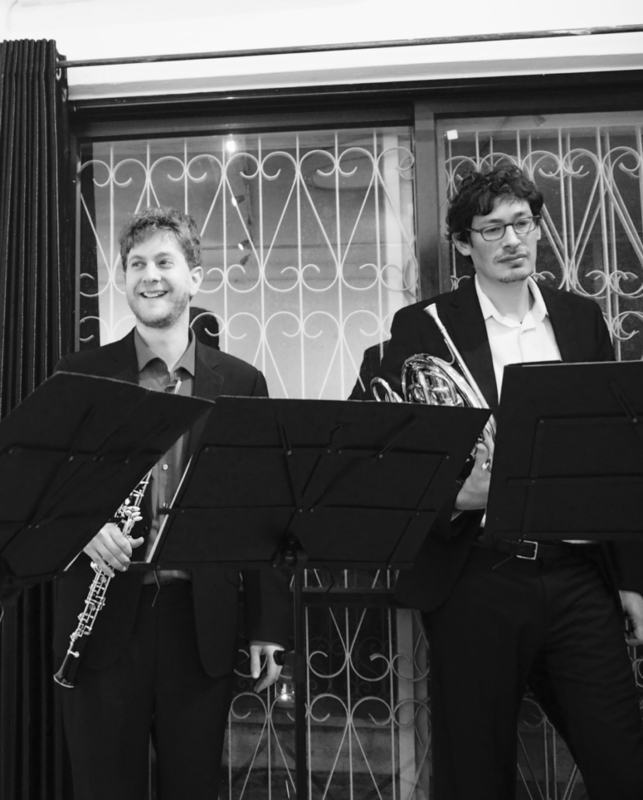 Known for their unique and stylistically open approach, the musicians took their listeners on a rich and varied jazz performance journey that crossed multiple genres across a wide range of improvisations. 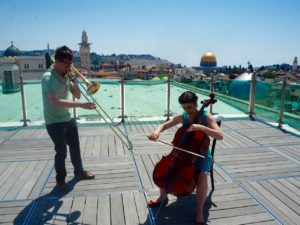 The musicians emphasized that it is hard to imagine places more appropriate for the mission of the UNESCO Jazz Day than Bethlehem or Jerusalem. These cities are special because they are fraught with tension and political crisis, but at the same time, are crosspoints of cultures, and filled with lively traditions and rich artistic heritage. 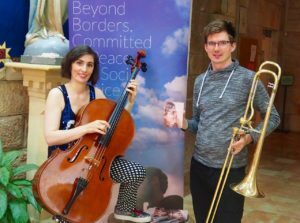 Their artistic contribution therefore reflected the meaning of the worldwide initiative, which, in the words of UNESCO goodwill ambassador Herbie Hancock is “crucial to ensuring that all people continue to hear this positive message and the music behind it”. The UNESCO Jazz Day events were organized by the Willy Brandt Center in partnership with the UNESCO National Office Ramallah, the Austrian Cultural Forum Tel Aviv, the Austrian Hospice, Bethlehem University and the Thelonious Monk Institute of Jazz in Washington. 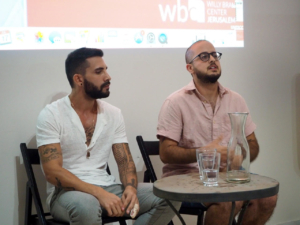 Striving to present and reflect on different narratives in Israel and Palestine, the Willy Brandt Center, in cooperation with the Israeli NGO Zochrot, presented the multi-award winning film „Born in Deir Yassin“. The movie features the history and development of Deir Yassin, a former Arab village close to Jerusalem which was conquered by the Jewish paramilitary groups Irgun and Lehi in a highly controversial battle in 1948. The village buildings today are part of the Kfar Shaul Mental Health Center, a public psychiatric hospital. The film traces a young man’s personal journey looking for records of his mother who was hospitalized at the premises. 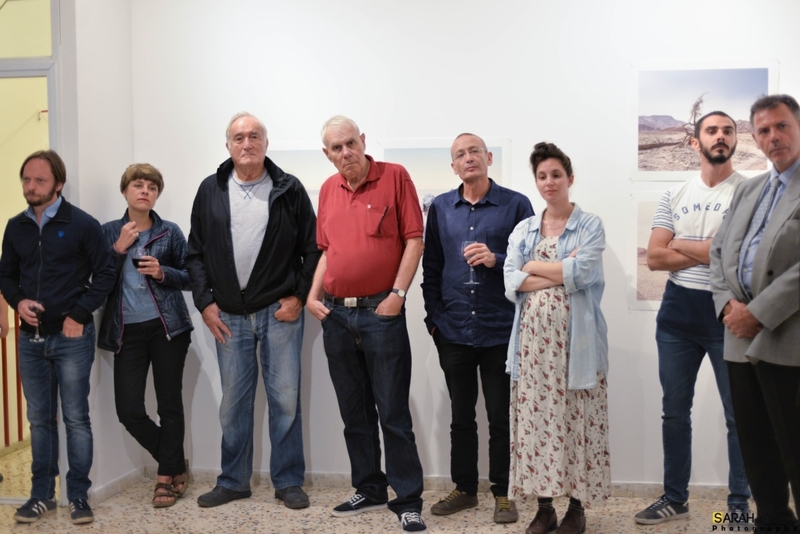 The film unveils not only her personal story but also those of former underground fighters in the war of Independence, who disclose the controversial narratives of Deir Yassin through their contradicting memories. 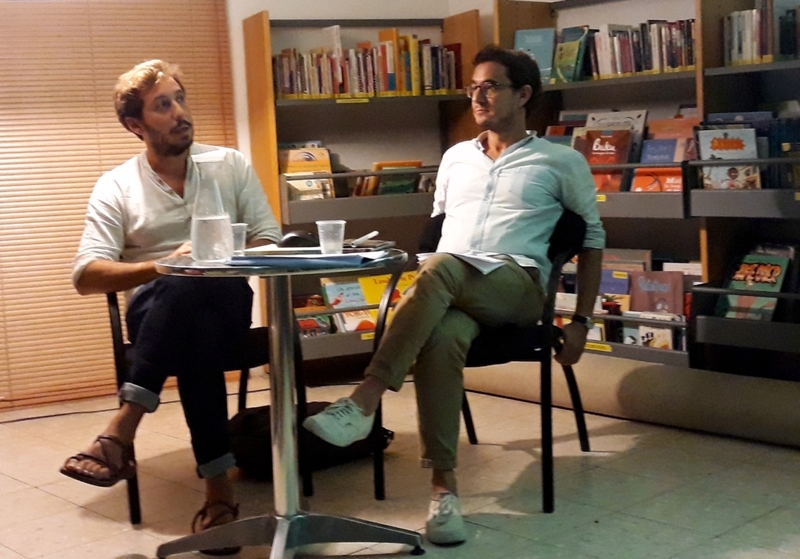 The well-attended screening was followed by a public discussion with film director Neta Shoshani and historian Dr. Adel Mana (Van Leer Institute), moderated by Debby Farber (Zochrot).